Joseph Mallozzi's Weblog: January 9, 2013: Days of Stargate Atlantis Past continues with season 5’s The Seed! January 9, 2013: Days of Stargate Atlantis Past continues with season 5’s The Seed! And what, pray tell, are THESE? you are no doubt wondering. 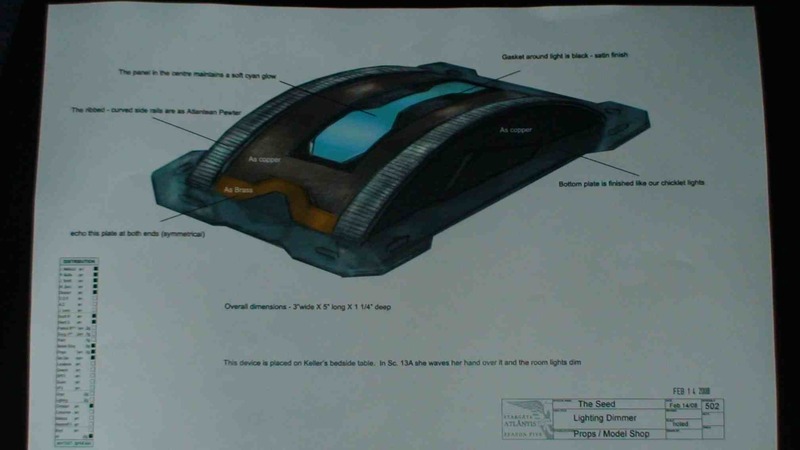 Well, THESE are Art Department handouts from Stargate: Atlantis’s fourth and fifth seasons covering everything from wall panels to sconces and buttress designs. I was about to recycle them when I stopped myself and thought: “Hey, you know who might like these? NOT me!”. But, maybe, a diehard fan might be interested in perusing the details that went into the making of an Atlantian Ship North Corridor Light Pillar or a Lantian Chair Room Weapons Chair Gak Box. Hell, these sketches, schematics, floor plans and blueprints are so comprehensive you could actually recreate your own Atlantis set if you so choose (and have the time, money, and manpower). And, hey, it’s not all minutiae. Amid the Core Room Console Base Brackets and Athosian Tent Placements are the occasional genuinely interesting finds: the Core Room Core Unit & Console, Aurora Pods, even the Midway Station! 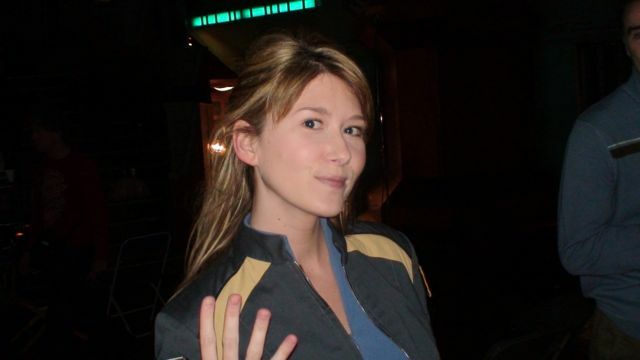 In her first appearance on Stargate, actress Jewel Staite was unrecognizable underneath all that prosthetics and make-up in season 2’s Instinct. She did such a terrific job in the role of Elia, the tortured wraith, that we ended up casting her as a completely different prosthetic-free character, Dr. Jennifer Keller, in the show’s 4th season. But old habits die hard and, when an early episode called for someone to get infected by an alien pathogen, we automatically thought of Jewel for two reason: 1. She’d done such a terrific job the last time and, most importantly, 2. She didn’t complain. And #2 is key since the episode required her to be in at 4:00 a.m. every morning for a three hour body cast session. One of the many great things about the show was the thought, creativity, and hard work that went into even the smallest elements of the production – like, say, these light dimmers. The Art Department’s Chris Beach takes one for the team. 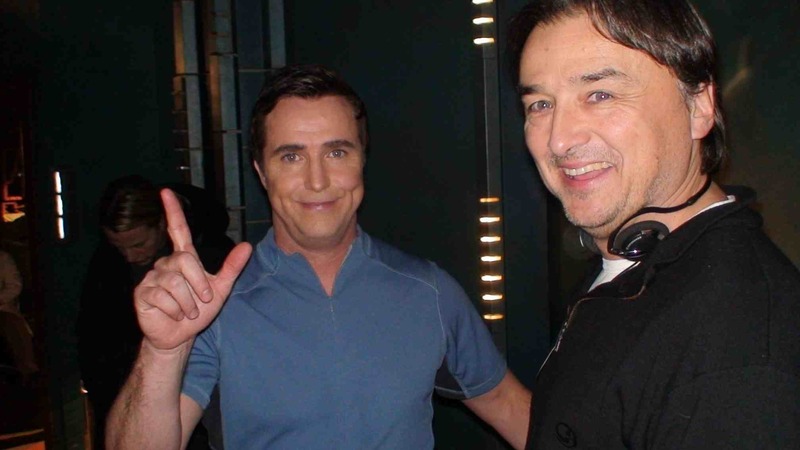 On set with actor Paul McGillion and director Will Waring. The lovely Jewel Staite. Before. 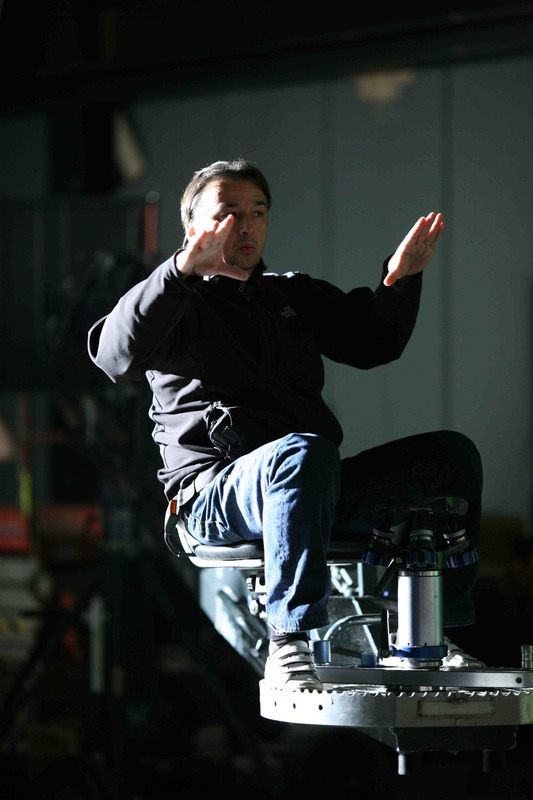 Director Will Waring at work (photo @ MGM Television). Hazmat Rodney. I want the action figure! (photo @ MGM Television). This is what happens if you don’t clean up after eating breakfast in bed. Previous Article January 8, 2013: Akemi’s unique perspective! Next Article January 10, 2013: The Akemi Update! *jumps up and down, waiving hand* Oh, oh, meeeee! Pick meeee! There. That saves you time time having to choose. Seriously, sign them and give ’em out at random. *WAVING, that is. Yeesh, I wish we could edit our comments! Question: When Beckett says “This isn’t a case of the hives”, was that an intentional reference to the fact that it actually WAS technically a case of the “hives”? If so – brilliant. Interested? YES! I’ll take the Midway Station, thankyouverymuch. Glad you didn’t recycle these, Joe! I always laugh at the toilet placement in “Midway”, can’t imagine how you’d, well, you know. One of my all-time favorite episodes. Riley woke up this morning lame as could be (rear leg), so had to take her to the vet this afternoon. Seems it’s just a sprain, but no idea when she did it as she was ok when we went to bed last night. If she doesn’t improve in the next couple of days, we’ll get some x-rays. She’s going to be a year old next month, and she’s a little over 60 lb now. Incredible how time flies! She’s a bit of a drama queen, but all in all, has turned out to be a really nice dog. 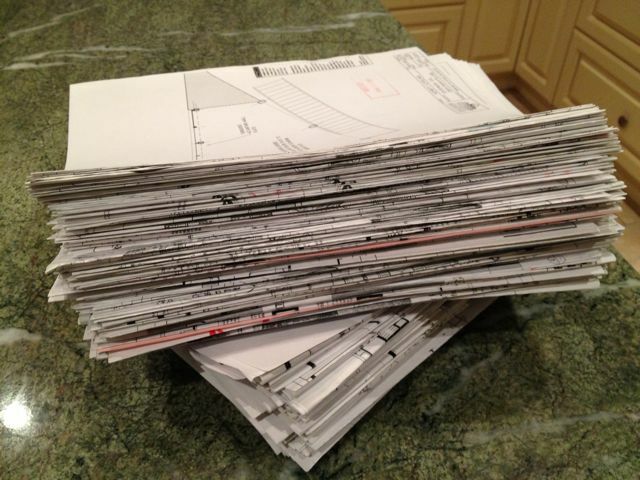 I think you should give the drawings to someone with experience in accounting for characteristics of, interpreting, and approving engineering drawings. Such a person would be able to appreciate them properly. Or, to assure their distribution to the most interested of fans, someone with a healthy eBay rating. I’ve got a great idea. Once Upon A Cure (Trey & Debbie Purcell’s charity) would probably love to get them and auction them off for charity. They could decide how many. They are already set up on EBay to do it. I’d bid. I’ve already bid on several items from Stargate from them, like autographed pictures, etc. Hope Akemi is having a great time. Hope the pups aren’t missing her too much (and you, too, of course). @Deni A year old already? I hope she heals soon. Sometimes Maddie slips on our floors and I cringe at the possibility of a $2500 ACL repair surgery. My first golden had to have two of those. I meant Deb and Ryan Purcell (Trey is their son). How about giving them to someone who could auction them off at a convention on behalf of a charity – oh…say…me for example. I would love to just study one, let alone be the actual owner of it! I’m so glad you didn’t recycle that art dep’t stuff! Hope you can distribute it to a variety of fans! The Seed was a really interesting episode, and again, thanks for the Shep Whump at the end! 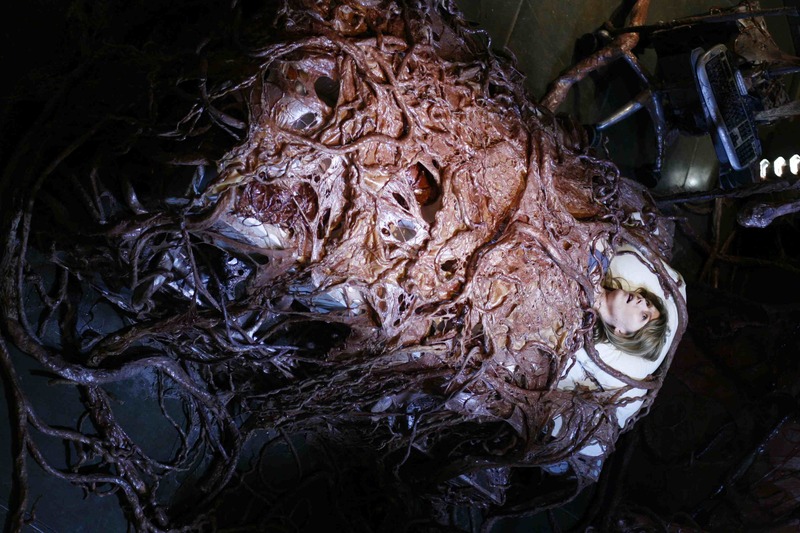 I always thought it would have been a good idea to have Keller complete the process of becoming a Hive Ship but then having her/it be loyal to our guys. Perhaps Todd could have become commander and Jewel could have played an avatar or something that appeared when needed. PS – Hope Akemi is having a good time! @PBMom: She’ll be a year old, but we’ve only had her 9 months. Still, time flies! 1.) You’ll need a temporary P.O. Box, or a PayPal account, so we can send you money for packing materials (envelopes & sturdy cardboard) and shipping costs. Do the drawings ever have People/character representation in them? 2.) I would LOVE to have a schematic that includes Carson Beckett or a scene he was in. Jewel is still pretty even with the, uh, er whatever it is she is wearing all over. PS – And I think it’s hilarious that that one photo has a title on it that says “Sheppard Impaled (again)” Love it! 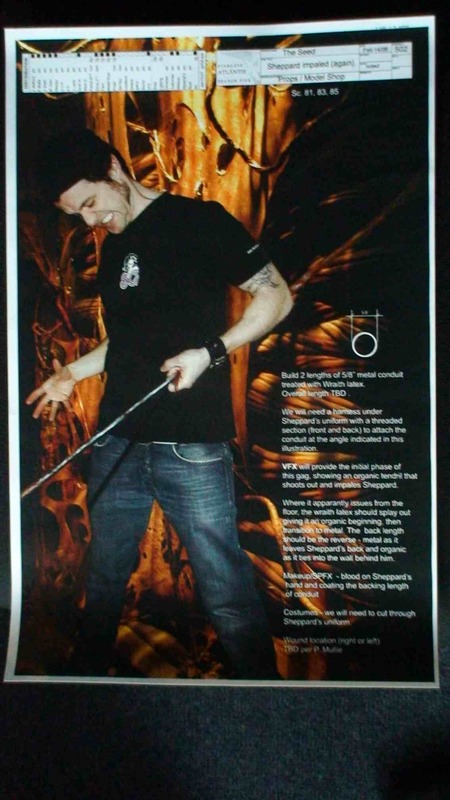 Cool behind the scenes pictures and info once again, really appreciate it, Thanks. My suggestion: Auction the “Swag” off and donate the proceeds to a dog charity, or any other favorite charity you have. Ohhhhh…schematics! (What else would an engineer say?) Of course I’d be interested, but I’ll admit the charity auction is a good idea. Do you mean the super high-def 4K TVs? I haven’t got a look at those since I’m stuck at the Encore doing an automotive center-stack demo. We’ll see if I get a chance later in the week. Another neat gadget shown here is a laser projection TV. 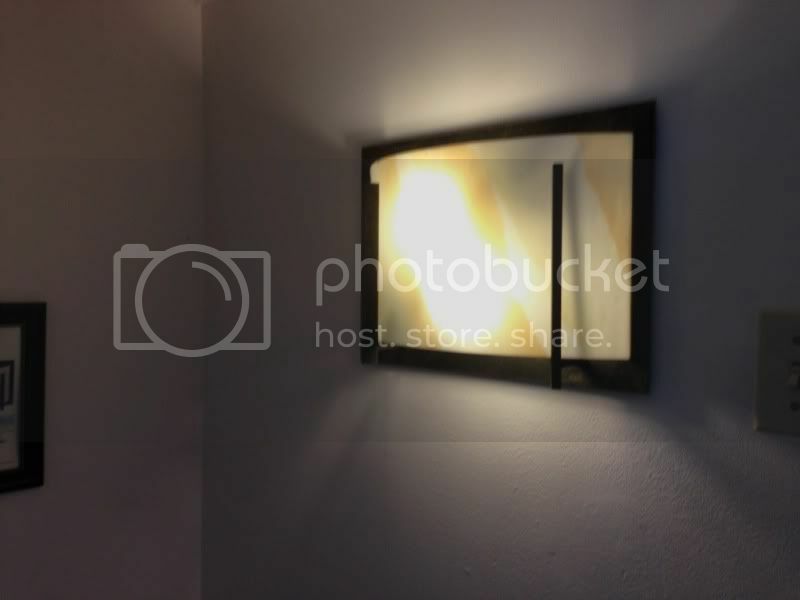 This is a device about the size of a matchbox that projects a super-sharp TV image onto walls, screens or even windows. Because it’s laser based, it doesn’t need to be focused and it remains very sharp no matter the surface. The technology uses silicon micro-machined mirrors to aim the lasers. Another division of my company makes it and you should start seeing it on cellphones and portable media players later this year. There are plans to scale it up to larger and brighter formats, meaning you could eventually see a projection TV for a whole wall of your house that is no bigger than a small paperback book. Mounting angle doesn’t matter as the unit measures the distance to each pixel (via timing the light pulses with an optical sensor) and then it automatically corrects for keystone. I want one too!! That would be so cool! I have a way to fairly distribute them. Send them all to my house and i will make sure no one else gets them. sound good? @JeffW: Those laser TV’s sound very cool – and very futuristic. Just like we should have in the 21st Century! Speaking of shows, in particular, The Transporter, I have seen that a couple of episodes have hit the bittorrents. I had to watch the first episode (I’d like to see all of them! ), and of course, I have to find the cookie of Spock and Kirk in stained glass in a shot. When are we (legally?) going to be able to watch this show?